In this article we will take a look at how Google finds and indexes websites. We will also look at ways to get your website rank higher on search result listings using the SEO tools found inside your Website.com editor. Google and other search engines use automated software, known as robots or spiders, to regularly crawl the Internet. It’s these robots and spiders that detect new websites as well as new updates on existing websites. These robots and spiders will collect all sorts of information on a website; the information will then be sent back to the search engine (ie. Google) for processing and filing (also called as indexing). When a person performs an online search, Google (or Bing) will look through its searchable index and returns results that are relevant to the searcher’s query. The results are ranked based on the popularity and value of the website serving the information. The value of a website is determined by many factors, including keywords on the website, relevancy of the content, frequency of content update, quality of links on the website, social factors (such as number of Facebook Likes or Shares), and more. Unfortunately, no one knows the exact formula (or algorithm) that Google and other search engines use for determining the value of a website. So there is no guaranteed way to that number one spot on the search result list. The study of how to get to the top spots on a search engine is called Search Engine Optimization, or SEO. Google’s robots (also known as Googlebots) crawl the Internet constantly, so sooner or later, they will make their way over to your website. But you can speed up this crawling and indexing process by submitting your website to the search engines. It’s like waving hello to Google so that it knows your website exists. Because Bing and Google are separate search engines, submitting your website to Google will not automatically notify Bing either. 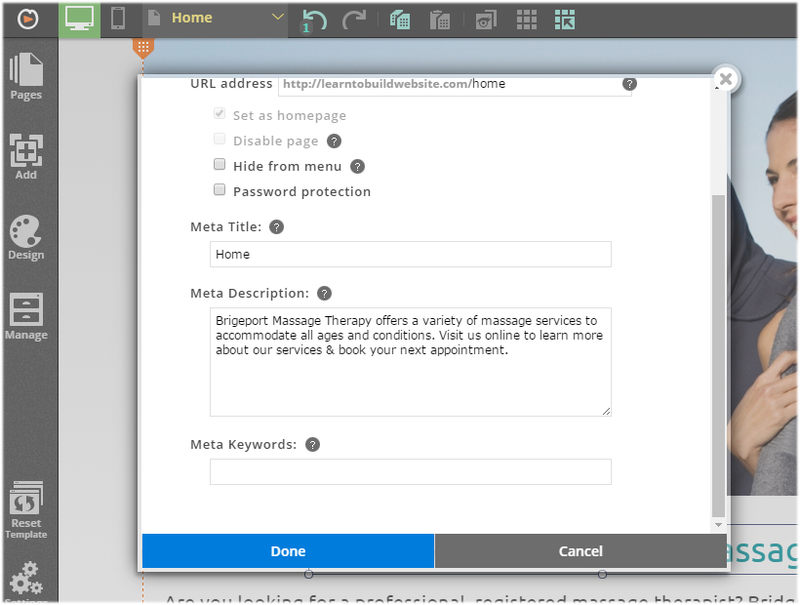 You will need to submit your website to Bing via Bing’s Webmaster Toolbox. How to make sure Google returns your websites when someone searches for it? First of all, Google needs to know what your website is about. It needs to know the keywords on your website, how “fresh” is your content, the relevancy and popularity of your content, etc. While Website.com cannot guarantee you will get the top spots on search result listings, we do provide tools that will help you along the way. Keywords are words and phrases that set the tone for your website’s content. They are generally the most common words that you use in your title and content. When Google crawls your website, it will pick up these commonly used words and identifies them as keywords. We recommend using Google’s Keyword Planner to find ideas for the keywords most relevant for your website. The keyword planner lets you learn what people search for in your area, allowing you to find relevant keywords to add to your website’s content. Once you have chosen the keywords you want to use, integrate them into your website’s titles and content, but do so naturally. You may have noticed that the content that shows up on a search engine result isn’t always taken directly from the website’s content. Instead, it’s an excerpt, or a customizable text called meta titles and meta descriptions. Website.com lets you edit your page meta information. 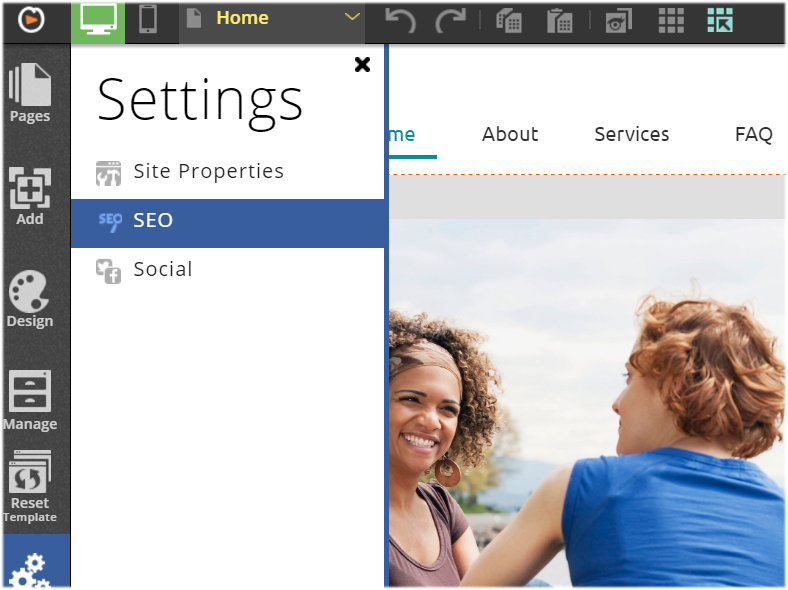 All you need to do is open the Page Settings panel for your web page(s) and enter the page meta information. While the actual effects of the social factor on your search engine ranking is still unknown (because let’s face it, Google is not going to tell you how many Facebook Likes or Twitter tweets you need to get to that #1 spot on the search result listings), it’s never a bad idea to encourage your visitors to share your website using social media sharing icons. Plus, the more your content is shared means the more popular and valuable it is – something that Google looks for. 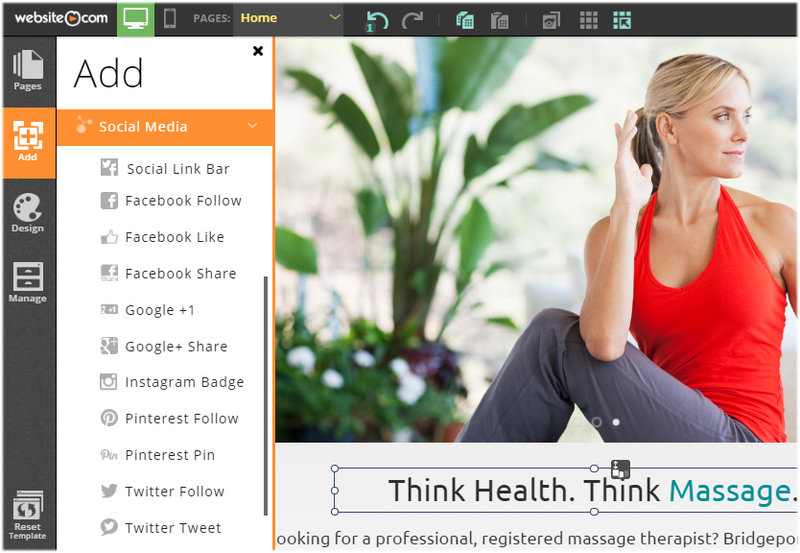 You can add various social sharing icons in just a mouse click, right from your Website.com editor. 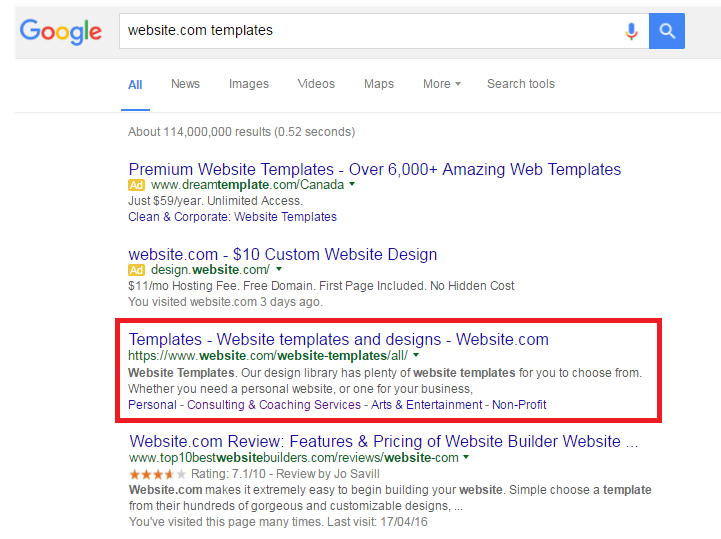 You can check if your website has been indexed by Google by doing a simple site:yourdomain.com search on Google. If none of your pages appear in the search results, then it means Google has not yet indexed your website. Maybe your website is too new and the search robots haven’t gotten around to crawl your website yet. You can speed up the crawling process by resubmitting your website URL to Google again via the Google Search Console. Did you know that you can even submit individual page URLs? Just make sure if you have password-protected your website, search engines will not index it. 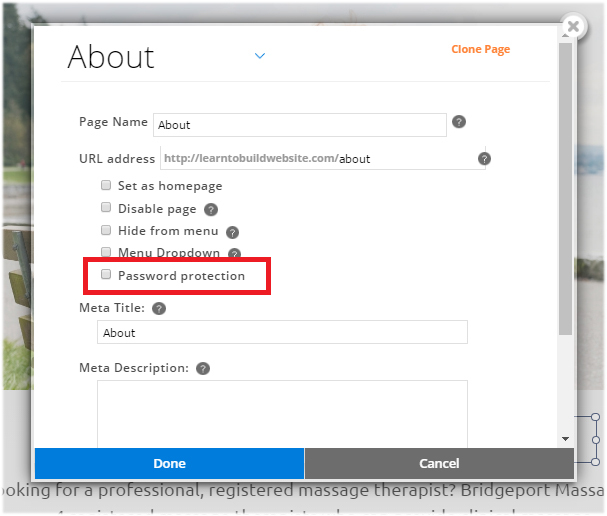 You will need to disable the password protection and then resubmit your website (or web page) URL to Google.